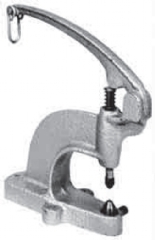 Manual screw presses for eyelets, tubular rivets and eyelet terminals. Also foot-operated presses. For eyeleting die sets refer to Consumables > Fasteners > Eyelets > Die Sets.